The greatest question, that every business investing in online advertising asks, is “did it lead to a sale?”. That’s a simple question when you sell things online like Amazon. What happens when you sell things offline, where people visit a store or, in this discussion – at a car dealership? Nobody buys a car online (yet), but dealers put big money into online advertising. How do we know how effective online advertising is at driving foot traffic to the showroom? Facebook & Google have a measurement for ‘in-store’ visits, but for the majority of dealers this will not work – dealers are not big enough in physical size and/or budget to leverage this measurement feature. However….there is one measurement feature that can let you sync up your offline data to your Facebook ads. Facebook Offline Conversions is a feature that lets you upload information about the people who purchased a vehicle. You can upload information about un-solds as well. You could upload sales data about service if you like. It really doesn’t matter what type it is, we want to measure who ‘purchased’ something, or who walked in the front door. Who, of this group of people, saw or clicked on your Facebook advertising? It’s an aspiration other mediums can only dream of. Google deals with cookies. They can’t do this type of matching. Radio or TV? No chance. It’s important to understand why Facebook can do this. When people use Facebook they are always logged into their account. You can’t use Facebook without identifying yourself. You can’t see Facebook ads without being identified. This means Facebook is aware of every ad you click on, or every impression you see (but did not click). They know you by name and all the information you share on Facebook. Car dealers now have that same information about people who serviced or purchased their vehicle at the dealership. Dealers have information about people in their CRM but never purchased. If both sides have this information, you just need to marry the two, and you can figure out how many of your customers saw or clicked on your ads. 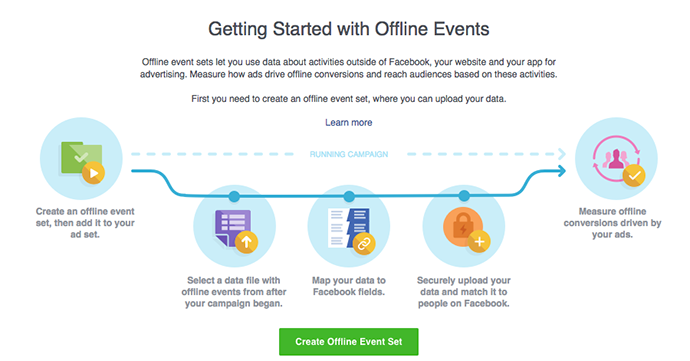 The whole process is handled by Facebook, and it creates the Offline Event Set for you. You upload your data in a CSV format (can be done via API) and voila – you have actionable data. Once everything has been uploaded you can view the information alongside your ad stats in Facebook Ad Manager. We recently completed these steps for a Lexus dealership for the months of March and April 2017. When you upload your data, you can include how much each ‘sale’ was retail. This allows Facebook to provide financial values beyond just counting a ‘sale’. In this example we used $1500 as the average PVR, I was told by the dealer it was actually closer to $2500. From March 1, 2017 to April 30, 2017. 0% of those 43 people submitted a lead online. Should be $40,000 in retail sales (with corrected PVR of $2500). When you can start to really see how influential Facebook ads are, you can start to plan and strategize around implementing Facebook, or utilizing it more. I’m not suggesting Facebook take all the credit for those sales/ups, there are too many paths and influences along the way. But these are hard numbers on ups and sales that should never be ignored.